Sorry folks, with all that Wrestlemania 35 shoved down my throat, one panel was all I could muster! I loved the show overall though- other than a few downers it was mostly feel good moments and decent payoffs. 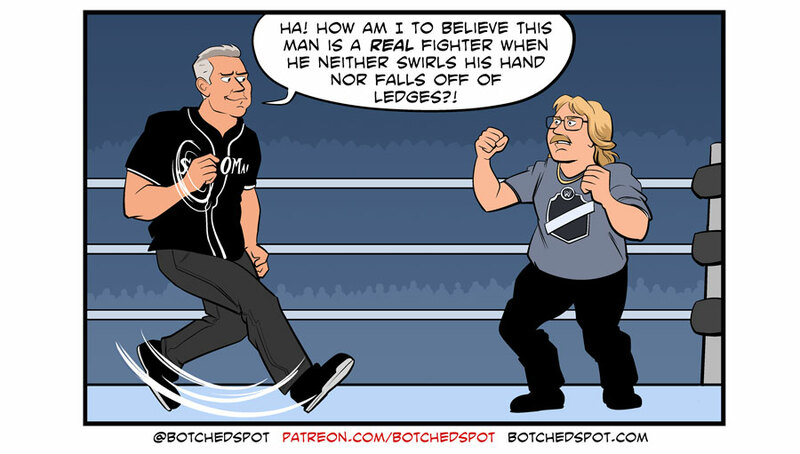 Shane taught Miz Dad how to box. Triple H pulled out Batista’s nose ring with pliers. Classic wrestling stuff. Becky’s win was the ending I was always wanted, but never dared to get my hopes up for. In a company obsessed with getting heat I was prepared to see Charlotte somehow take the titles home. Even though the ending looked a little botched, it was the outcome I wanted and after seven and a half hours of Wrestlemania I was ready for it to be done. Kofi’s win was also a great moment, even if WWE spoiled it by having a new belt covered with a cloth at ringside. I guess you could say it was there just in case Kofi won, but it’s not like they did that for Bryan’s other title defenses. Watching New Day celebrate with Kofi’s kids was a great Wrestlemania moment though, and I hope Xavier and Big E will wait a long, long, time before turning on him. I was glad to be wrong (very, very, wrong) about the Universal Championship. Seeing Seth win so quickly wasn’t what I was hoping for, but it wasn’t necessarily bad- I think some of my favorite Brock matches are his shorter ones. Even the bad stuff was mercifully short. Yeah, I didn’t really want to see Kurt’s retirement match end with another loss to Baron Corbin, but it was only a little over five minutes. I was also disappointed to see Miz lose (why does Shane ever need a win?) but going into the match I didn’t care much about it at all, so I guess they won me over in the end. I can’t say that there were any really great matches at Wrestlemania, certainly none on the same level as NXT TakeOver from Friday, but the end results were what I wanted so it left a good impression. But where was Kevin Owens?